NATO Secretary General Jens Stoltenberg (Center) and Lithuanian President Dalia Grybauskaite (L) visit to air-traffic control center in Karmelava on Nov. 21, 2014. Lithuania is publishing a manual to advise its citizens on how to survive a war on its soil as concerns grow that Russia’s intervention in Ukraine heralds increased assertiveness in its tiny Baltic neighbors. In the event of invasion, the manual says Lithuanians should organize themselves through Twitter and Facebook and attempt cyber attacks against the enemy. Lithuania spent much of the last century incorporated in Soviet Union, along with Latvia and Estonia, and upon independence in 1991 quickly sought to join the Western NATO alliance and the European Union. It is increasingly worried about Russia, not least because of a military drill in the Russian enclave of Kaliningrad last month that featured 9,000 soldiers and more than 55 naval vessels. “The examples of Georgia and Ukraine, which both lost a part of their territory, show us that we cannot rule out a similar kind of situation here, and that we should be ready,” Defense Minister Juozas Olekas told Reuters. The Lithuanian army and its paramilitary reserve force have seen increased recruitment since the crisis in Ukraine. “When Russia started its aggression in Ukraine, here in Lithuania our citizens understood that our neighbor is not friendly,” Olekas added. The government is also considering requiring all future buildings to incorporate a bomb shelter on the premises. Russia annexed the Crimean peninsula from Ukraine last year, and Western governments say they have overwhelming evidence that it is supplying troops and weaponry to pro-Russian separatists who have seized parts of eastern Ukraine, an accusation that Moscow denies. Kim Jong-un, the North Korean dictator, has accepted an invitation to attend a ceremony in Moscow on May 9 to mark the 70th anniversary of the Soviet Union’s victory over Nazi Germany. 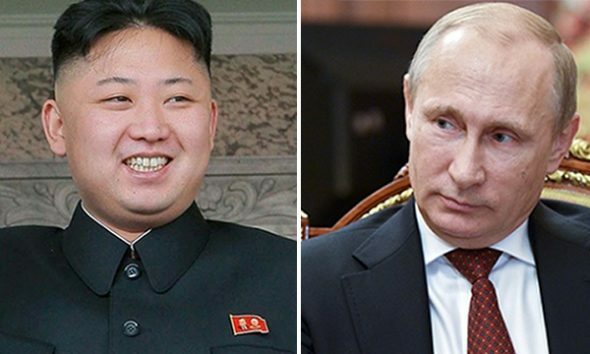 North Korean dictator Kim Jong-Un (l) and Russian President Vladimir Putin (r). The invitation was extended by Vladimir Putin, the Russian president, and will be the young dictator’s first overseas trip since he became head of state after the death of his father, Kim Jong-il, in December 2011. Kim’s personal envoy travelled to Moscow in November as part of efforts by the two Cold War-era allies to improve relations. 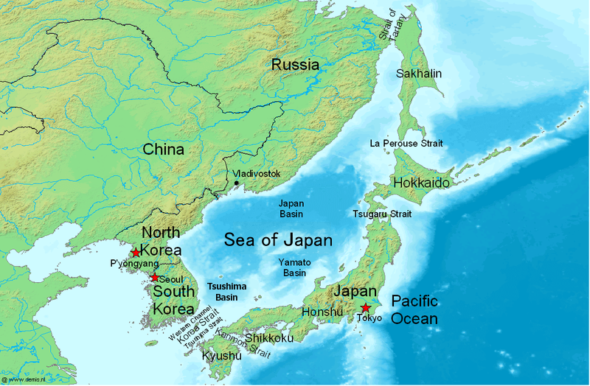 Korea was under Japanese rule before and during the Second World War. The Soviet Union declared war on Japan in August 1945, after Japan’s ally Adolf Hitler had been defeated, and launched an invasion of northern Korea. Moscow has invited many world leaders – including Kim and the presidents of China and South Korea – to celebrations which will include a massive parade on Red Square. … A spokesman for the Russian leader has confirmed that Moscow had invited “representatives of anti-Hitler coalition countries and many others” to the event. South Korean government sources have confirmed that Mr. Kim will travel to Moscow in May, according to Yonhap News, as Pyongyang tries to simultaneously build better trade and security links with Russia and to convince Beijing to drop its recent hard-line stance against the regime. China has distanced itself from the rulers of the hermit state since the regime carried out a third underground nuclear test in February 2013. Despite sanctions and unprecedented international pressure, North Korea has since carried out a series of ballistic missile tests and demanded that United Nations sanctions be lifted. Beijing wants to ensure, however, that Moscow does not step into the breach and provide the isolated North Korea with the trade and diplomatic and security support required to keep the regime functioning. Moscow needs North Korean cooperation to boost its natural gas exports to South Korea as Russia’s Gazprom would like to build a gas pipeline through North Korea to reach its southern neighbor. Pyongyang is also seeking support from Russia, a permanent veto-wielding member of the UN security council, against international criticism relating to accusations of human rights abuses and its nuclear program. Leaders from around the world will have been carefully considering their invites from Mr. Putin to the May 9 ceremonies, even before Mr. Kim’s acceptance. The international community is still putting up a united front over Moscow’s actions in the Crimea and Ukraine. Learning that they will have to share a podium with Mr. Kim – who is likely to be named in a resolution put to the United Nations Security Council for North Korea to be referred to the International Criminal Court for crimes against humanity – is likely to convince the vast majority to mark the occasion of the end of the war elsewhere. 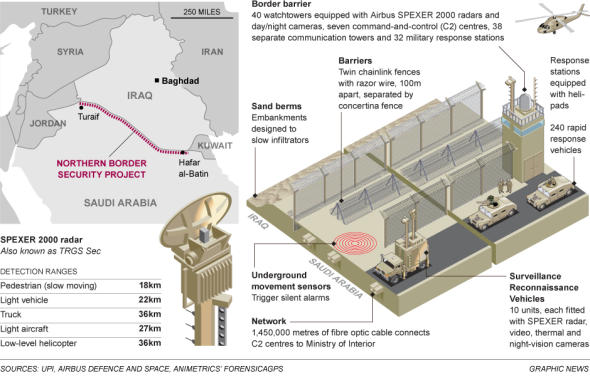 The Saudi government is building a 600-mile-long “Great Wall” – a combined fence and ditch – to separate the country from Iraq to the north. Much of the area on the Iraqi side is now controlled by the Islamic State (ISIS), which regards the ultimate capture of Saudi Arabia, home to the “Two Holy Mosques” of Mecca and Medina, as a key goal. The proposal to close the border had been discussed since 2006, at the height of the Iraqi civil war, but work began in September 2014 after ISIS’s charge through much of the west and north of Iraq gave it a substantial land border with the Saudi Kingdom to the south. Riyadh also sent an extra 30,000 troops to the area. It is not the only fence with which Saudi Arabia has chosen to surround itself. Despite the difficulty of access to westerners, the country is relatively open to fellow Muslim nations, particularly during the Haj season when pilgrims from across the world come to Mecca and Medina. However, that is changing in changing times. 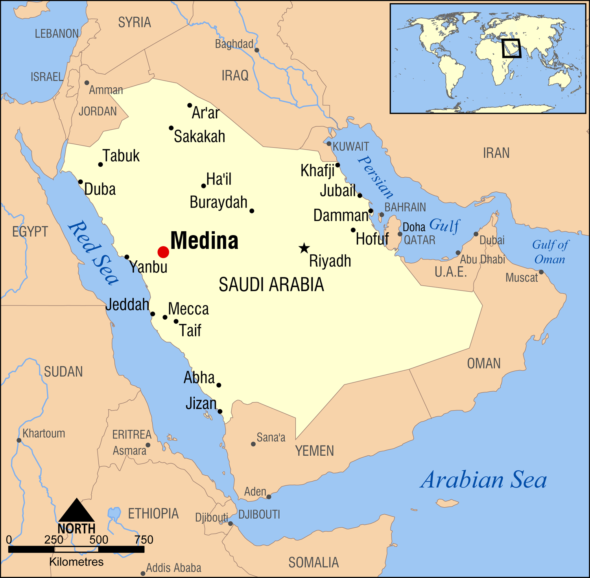 The Saudi government has also created a physical barrier along parts of the even longer, 1,000-mile border with Yemen to the south. On Jan. 5, ISIS jihadists attacked a Saudi border post. The attack is the sort of incident the Saudis hope to avoid. Three border guards, including General Oudah al-Belawi, commander of border operations in Saudi Arabia’s northern zone, were killed. Mustafa Alani, an Iraqi security analyst with close ties to Saudi Arabia’s interior ministry. “It is the first attack by Islamic State itself against Saudi Arabiaand is a clear message after Saudi Arabia entered the international coalition against it,” he said. All four attackers also died. b) How does the government tell Lithuanians to respond to an invasion? c) Why is the government taking the possibility of a Russian invasion seriously? d) Ask a grandparent whether he/she thinks Russia would invade Lithuania, in light of President Putin’s actions over the past few years. b) What is believed to be Vladimir Putin’s motive for inviting Kim Jong-Un to the commemoration? b) For what two reasons does ISIS want to conquer Saudi Arabia? 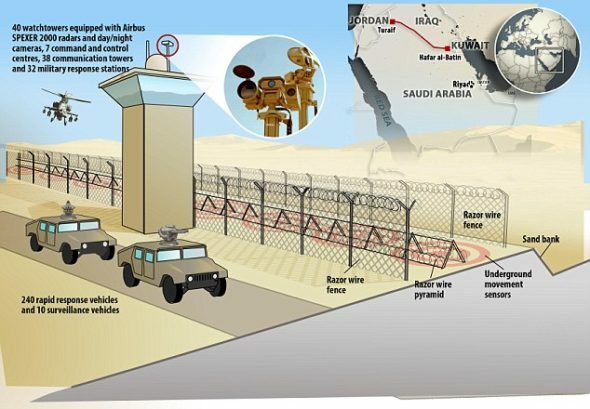 c) Where is Saudi Arabia’s other border fence? d) Ask a parent, what do you think about the controversy over building a border fence along the U.S./Mexico border when many other countries have build various fences/walls? ISIS is a Sunni Islamist movement, which has declared its own caliphate and wants to redraw the map of the Middle East. It has called for “lone-wolf” attacks against Saudi security forces, the Shi’ite Muslim minority and foreigners.